The Iowa State Cyclones host Kansas State in Big 12 action on Saturday. Iowa State is 2-5 in the Big-12 while the 10th ranked Wildcats are 5-3. Iowa State coach Greg McDermott who says K-State will test their toughness as they are very talented and can beat you a lot of different ways. He says they are physical and tough and will foul you every posession and you have to be tough enough to play through that. 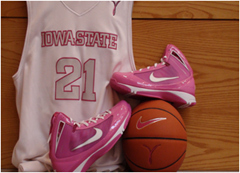 It is a breast cancer awareness game and the Cyclones will wear pink uniforms. Forward Craig Brackins says the Cyclones need to avoid the scoring droughts that have hurt them in a number of games. In Wednesday’s 21 point loss at Baylor, the Bears broke the game open with a 7-0 run early in the second half. Brackins says it is hard to win on the road and they need to protect their home court and regroup. The Cyclones are 13-9 overall while Kansas State is 18-4.